The begonia family contains about 900 species. They grow best in neutral soil and in the shade. They have heart-shaped hairy leaves and a variety of flowers. 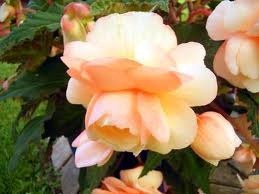 Tuberous begonias have rhizomes that cause the perennial to spread. They can grow to be 16 inches high. Tuberous begonias like temperatures above 59 degrees F. Tuberous begonias are propagated by stem cuttings. Wash a four-inch plant pot with soapy water. Use one part bleach mixed with nine parts water to rinse the plant pot. This sterilizes the plant pot, getting rid of any plant disease and hidden pests. Cut a healthy stem off your parent plant that has at least four groups of leaves branching off it with a sharp knife. The knife should be sharp to prevent damage to the cutting. Strip the bottom leaves off the stem, leaving the top two or three sets. The bare leaf nodes at the bottom will produce the new roots. Fill the plant pot with peat moss and spray it down with water. Make a hole in the soil with the eraser end of a clean pencil. Insert the stem cutting into the hole. Firm the soil around the stem, cutting with your fingertips so it does not fall over. Water the cutting and soil to settle the soil in around the stem. Insert three or four craft sticks along the sides of the plant pot. Place the plant pot in a gallon-size resealable bag. Do not let the plastic bag touch the leaves to prevent leaf rot. Seal the bag and place in a warm area protected from direct sunlight. Move the cutting to a brighter light area when growth begins to show in two to four weeks. Gently tug on the plant. If it resists the pull, then roots have formed. Take your begonia cuttings when the parent plant is in a new growth cycle. It should be before flowering or just after blooming in the spring. Do not use garden soil since it can harbor hidden diseases and pests. Normal garden soil becomes compacted by repeated watering. Begonias normally suffer leaf drop in the winter. If the foliage colors begin to fade, move your begonia to a brighter spot. Begonias grow well under fluorescent lights.